To study motor ability at seven years of age in children treated for idiopathic clubfoot and its relation to clubfoot laterality, foot status and the amount of surgery performed. Twenty children (mean age 7.5 years, SD 3.2 months) from a consecutive birth cohort from our hospital catchments area (300.000 inhabitants from southern Sweden) were assessed with the Movement Assessment Battery for Children (MABC) and the Clubfoot Assessment Protocol (CAP). Compared to typically developing children an increased prevalence of motor impairment was found regarding both the total score for MABC (p < 0.05) and the subtest ABC-Ball skills (p < 0.05). No relationship was found between the child's actual foot status, laterality or the extent of foot surgery with the motor ability as measured with MABC. Only the CAP item "one-leg stand" correlated significantly with the MABC (rs = -0.53, p = 0.02). Children with idiopathic clubfoot appear to have an increased risk of motor activity limitations and it is possible that other factors, independent of the clinical status, might be involved. The ability to keep balance on one leg may be a sufficient tool for determining which children in the orthopedic setting should be more thoroughly evaluated regarding their neuromotor functioning. Idiopathic clubfoot is an isolated birth deformity affecting 1:1000 children, with a male-to-female ratio of 2.5:1 . Typically, the forefoot is in inversion including a cavus, the hindfoot is in varus and equinus. Muscle activity is dominated by inversion/plantar flexion. Severity can range from very mild to very severe . Treatment should start as soon as possible after birth. Primarily non-operative management is advocated [2–4] as extensive surgery is often related to inferior outcomes . To maintain the initial correction, treatment continues with the use of an orthosis. The treatment goal is a foot with sufficient mobility and muscle function enabling daily activity and sport leisure without pain, stiffness or shoe problems. It should be emphasized that a clubfoot can never become "normal". Common findings are a shorter and wider foot, a thinner calf, reduced muscle strength and endurance, and restricted foot and ankle mobility [6, 7]. No studies have been made on how these factors influence the child's motor performance. Generally, outcome assessments after clubfoot treatment are focused on joint mobility, radiographs and registration of pain, i.e. items on body structure and body function levels according to the International Classification of Function, Disability and Health (ICF) . Problems in activity and participation domains are sparsely touched. Studies on how children treated for idiopathic clubfoot cope in motor activities are rare . To monitor child movement capacity at our clubfoot clinic, we included the Movement Assessment Battery for Children (MABC) in the routine clinical follow-up at seven years of age. MABC is a standardized screening instrument specifically developed for the evaluation of motor ability in children . We also use a multi-level standardized follow-up instrument specially developed for children treated for clubfoot, the Clubfoot Assessment Protocol (CAP) [11, 12]. The CAP includes variables on joint mobility, muscle function, morphology and functional activity (Table 1). A summary of the Clubfoot Assessment Protocol (CAP) and its cut-off points. Item level: 0, 2 and 4. Item level: 0, 1, 2, 3 and 4. Item level scores: 0 = cannot/++ poor, 1 = very deviant/+ poor, 2 = deviant/poor, 3 = slightly deviant/slightly poor and 4 = within normal. The aims of this study were to explore motor ability among children treated for idiopathic clubfoot and its relation to clubfoot laterality, foot status and the amount of surgery performed. Twenty-nine children from our hospital catchments area (300.000 inhabitants from southern Sweden) were consecutively referred for clubfoot treatment between 1995 and 1998. Twenty-two of these new-born children were diagnosed with idiopathic clubfoot and eligible for this study. Written informed consent was obtained from parents of 21 of the 22 children. One child could not be tested at this age because of ongoing postoperative casting and rehabilitation after a tibialis anterior transposition. A total of 20 children (6 girls, 14 boys) with a mean age of 7.5 years (SD 3.2 months) were finally included. Ten had unilateral and 10 bilateral clubfoot. At birth the children showed no statistically significant differences regarding severity between unilateral and bilateral clubfoot according to the Dimeglio classification system . Eighteen feet were classified as moderate and 12 as severe with a median severity score of 10.9 (range 6-15). All children had been treated according to a modified Copenhagen method [3, 9, 14]. During weekdays, daily mobilization (stretching of all shortened soft tissue and manipulation of contract joints) was done and weakened muscles were stimulated manually by triggering movement by the physical therapist. Obtained correction was maintained with the use of an adjustable splint. At the age of two months, surgical intervention was performed in 26/30 feet: posteromedial releases including achilles lengthening in 24 feet, and percutaneous achilles tenotomy in 2 feet. Four feet were fully corrected in its varus- adduction component and had a dorsalflexion >5° and continued directly with the orthose treatment. Knee Ankle Foot Orthosis were used during the first two months 18 hours a day, decreasing successively during daytime until the age of 8 months and continued only nighttime until the child started to walk. Thereafter a dynamic Ankle Foot Orthosis was used during nighttime until the age of four years. These orthosis have the ability to give a prolonged stretch to the Achilles tendon. In eight feet a tibialis anterior transfer was performed after the age of three years. The study was approved by the Ethics Committee at Lund University Hospital (LU 666-03). The MABC test contains eight items that represent the main motor skills of children between 4 and 12 years of age. These items are divided into three subgroups: manual dexterity, ball skills and balance, integrating coordination, concentration, visual-spatial perception and balance in fine and gross motor performances. MABC has been proven to be a valid and reliable instrument [10, 15, 16]. Four age bands are formed with different items but covering similar skills which are age-adjusted (4-6, 7-8, 9-10 and 11-12 years). The total score can vary between 0 and 40 (best-worst). A large sample of norm-reference was studied and the raw scores were transformed into percentiles provided in the manual . An MABC result below the 5th percentile (MABC ≥ 13.5) indicates definite motor problems. Results between the 5th and the 15th percentile (MABC 13.4-10) indicate borderline problems. The motor ability in typically developing children, above the 15th percentile, corresponds to an MABC score below 10. The MABC subscores and their cut-off percentiles are mainly used for creating a profile on the child's motor difficulties. Factors such as how the child carries out the task (motor quality), the child's behavior (e.g. concentration, impulsivity) and physical deficiencies (vision, neurological and orthopedic problems) have to be incorporated in the evaluation to enable intervention and treatment planning. In this study only the quantitative data were used and compared to the expected distribution according to the MABC standardization. The children were tested with age band 2 (7-8 years) (Table 2) . A summary of the Movement ABC (MABC) test age band 2 (7-8 years). The MABC assessments were done by a neurodevelopmental physiotherapist experienced in the MABC test and with no previous knowledge of the study children or their foot status. The CAP (Table 1) was used for analyzing the clinical outcome of the clubfoot treatment. Twenty items divided between body structures/body function and activity domains according to the International Classification of Function, Disability and Health (ICF)  form the CAP. The focus is on item and subgroup level. The items scoring range from 0-4 (worst to normal). In previous studies the CAP has been shown to have moderate to good reliability  and validity . All CAP assessments were performed by an experienced physiotherapist at the orthopaedic department (HA). The assessments took place in a child-friendly environment during early afternoon. First the clinical examination was performed, followed by a 15-minute break and finally the MABC test. The whole procedure took approximately one hour. No surgery or only tendo achilles lengthening (TAL) were categorized as no or minor surgery. Postero-medial release (PMR) or tibialis anterior transfer (TAT) were categorized as extensive surgery. Fisher's exact t-test using a multinomial distribution was used to check differences in motor performance between the study group and the distribution in the normal population. Standard Fisher's exact t-test was used to analyze the relationships between surgery and motor capacity and between clubfoot status and motor capacity. Mann-Whitney U-test was used for comparing motor ability between the children with uni- and bilateral clubfoot. The Spearman correlation coefficient (rs) was used to evaluate the correlations between MABC test and the CAP scores. Their graph plots were checked for skewness. The mean values from the right and left foot of CAP assessments were used for correlation between the MABC and the CAP. For the MABC the 15th percentile was used as cut-off point . As no cut-off points have been established for the CAP to classify good and/or poor overall clubfoot outcomes, we arbitrarily constructed cut-off points for the items, domains and total scores of the CAP (Table 1). The highest total CAP feet score is 76. For children with bilateral clubfeet the cut-off point at child level was calculated as 75% of 76 points = 57 points. For children with unilateral clubfoot the cut-off point at child level was calculated as (76+57)/2 = 66.5 points. The statistically significant level was set at p < 0.05. Data were analyzed using SPSS 12.0 and StatXact 3.0. The median MABC score was 6.5, with Inter Quartile Ranges (IQR) 3.6-10.5 (Table 3). Of the 20 children, two had clear motor disability (MABC below the 5th percentile) and five had motor activity limitations (MABC results between the 5th and 15th percentile), compared with the expected one and two respectively (p < 0.05) (Figure 1. Motor ability: Observed versus Expected. Fisher's exact test p < 0.05). No statistically significant relation was seen between the amount of surgery and MABC outcome. 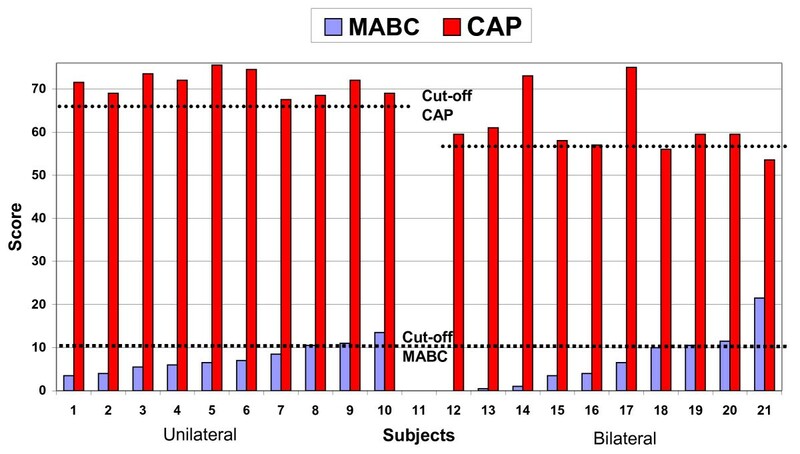 Median (Inter Quartile Range) for MABC test scores and CAP scores from 20 seven-years old children treated for idiopathic clubfoot. Children with uni- and bilateral clubfoot showed no statistically significant difference in MABC score (MABCtotal p = 0.49, MABCHand function p = 0.41, MABCBall skills p = 0.87 and MABCBalance p = 0.73). In the whole group, significantly increased performance problems at subtest level were found for the MABC-Ball skills (p < 0.05). MABC results below the 15th percentile were present in three of ten children with unilateral and four of ten children with bilateral clubfoot, and in three of six girls and four of 14 boys. A significant lower (p < 0.05) foot status was found for children with bilateral clubfeet. The median CAP total score at foot level was 67.5 (IQR 62-71) for the children with unilateral clubfoot and 59.5 (55-64) for the children with bilateral clubfoot. At child level the CAP total score showed a median of 71.5 (IQR 69-73.5) for the children with unilateral clubfoot and 59.5 (IQR 57-59.5) for the children with bilateral clubfeet (Figure 2. 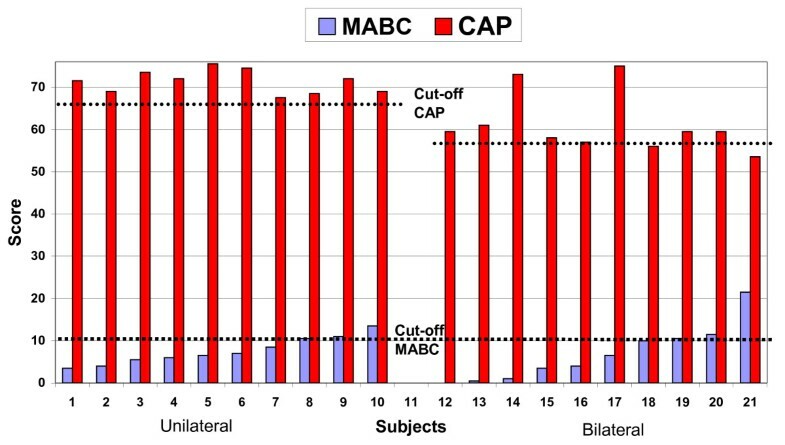 The relation between motor ability according to the MABC test and the CAP total scores on child level and their cut-off points. The higher the CAP score, the better the foot status; the lower the MABC score, the better the motor activity capacity. Spearman correlation coefficient - 0.24, p > 0.05. Fisher exact test p > 0.05). Only the item CAP "one-leg stand" showed significant correlations with the MABC-total (- 0.56, p = 0.02). Three children (all with bilateral clubfoot) had unsatisfactory overall foot status according to the total CAP cut-off points, with a median of 55 (53.7-56.3) (Figure 2). Two of these children had low motor activity capacity in the lowest 15th percentile according to the MABC (21.5 and 10.5 points). None of the ten children with unilateral clubfoot had poor overall status according to CAP, but three of these children showed low motor activity capacity in the 15th percentile on the MABC (13.5, 11 and 10.5 points respectively) (Figure 2). This is, to our knowledge, the first study performed on motor abilities in an unselected cohort of children of the same age, previously treated for idiopathic clubfoot. 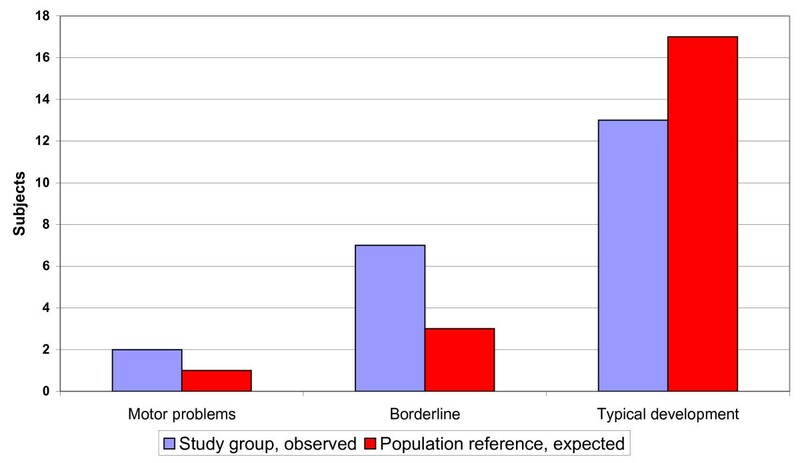 In general the clubfoot treatment outcome in this study population was good, with only six (three children with bilateral clubfeet) out of 30 feet showing scores under the cut-off point of the CAP. A high prevalence of motor activity limitations was found on the MABC testing. Motor ability was not related to clinical foot status, uni- or bilateral clubfoot or amount of surgery performed. The strengths of this study were that all children were of the same age and assessed by the same assessors (one of whom was blinded), thus increasing reliability. The distribution of uni- and bilateral clubfeet and the gender distribution were as expected . The major limitation of this study is the use of the norm-based MABC percentiles as a reference instead of a matched control group. However, the control groups in the study by Foulder-Hughes LA and Cooke RW  and in Davis NM et al  showed medians (IQR) of 3.50 (1-6.63) and 1.5 (0.5-3.5) respectively, supporting the norm-based cut-off points of Henderson SE and Sugden A . Others have observed that the MABC norms may be out of date as motor ability might be decreasing in the population . Interestingly, children with unilateral clubfoot had the same degree of motor problems as children with both feet involved, although children with bilateral clubfeet had significantly poorer clubfoot outcome. This indicates that other factors besides foot function play a role in these children's motor abilities. Ball skill problems were significantly more common than expected in this sample, though no high demands are made on the standing ability of the child during these ball tasks. Balance skill problems according to the MABC showed a tendency to be increased, though not reaching statistical significance in this study of 20 children. Decreased plantar flexion power and mobility are commonly found in treated clubfeet [6, 20], and are known factors influencing balance . Primarily, one leg stand is a test specific for postural control incorporating motor control, sensory and cognitive processes. Disturbances in the somatosensory system through surgery may influence perception, a prerequisite for postural control . However, we found no relation between the amount of surgery and MABC outcome. Expectedly, as static balance is an item in the MABC test, the item CAP one-leg stand showed relatively high and significant correlation with the MABC, confirming that they measure similar constructs. No significant correlations were found for the other CAP subgroups, items or total score. We conclude that these two tests mainly assess different functional aspects in children treated for clubfoot. Buus  also concluded that the one-leg stand test was the most revealing for the child's neuromotor status. This study indicates that other dysfunctions may exist in at least a proportion of children with so-called idiopathic clubfoot. Both a high rate of ADHD traits  and elevated odd ratios for joint laxity  found among children with idiopathic club foot may support this. For several reasons there is an obvious risk that disorders of motor performances in children treated for idiopathic clubfoot might not be recognized or taken seriously. Firstly, outcome instruments used within clubfoot treatment are not focused on performance on activity/participation levels. Secondly, motor disabilities may automatically be related to the child's clubfoot. Particularly in child health surveillance programs, the detection of children with neurodevelopmental disorders may be hampered if deviant motor ability screening results are blamed on the club foot. Experiencing less success in movement skills, in sports, playground and other daily activities, may cause avoidance of these situations, decreasing the children's opportunities to gain the practice and experience necessary to develop both motor skill competence and social interactions required for well-being . This study showed that low motor ability as assessed by the MABC was more prevalent in children treated for idiopathic congenital clubfoot but did not automatically relate to the clinical outcome, laterality or the amount of surgery which is commonly assumed. This indicates that other factors beside muscular-skeletal deficiencies might be involved in the child with clubfoot. The ability to keep balance on one leg may be a sufficient tool for determining which children in the orthopedic setting should be more thoroughly evaluated regarding their neuromotor functioning. This study was supported by Lund University Hospital, Skåne Region, Sweden. Special thanks to Per-Erik Isberg, Department of Statistics, Lund University, for statistical advice and to Gunilla Svensjö, RPT, Children's Hospital, University Hospital, SE-221 85 Lund, for help with the assessments. HA designed the research. HA collected the data and drafted the manuscript. HA, GH and LW analyzed and interpreted the data. GH and LW revised the manuscript. All authors read and approved the final manuscript.